Edward Elwyn Jones enjoys a growing career in the operatic, orchestral and choral genres as conductor, organist and choirmaster. As the Gund University Organist and Choirmaster at Harvard University, a post he has held since 2003, Mr. Jones directs the music program in Memorial Church, located in the midst of Harvard Yard, and leads the 180-year old Harvard University Choir in its daily choral services, broadcasts, tours, commissions, and recordings. 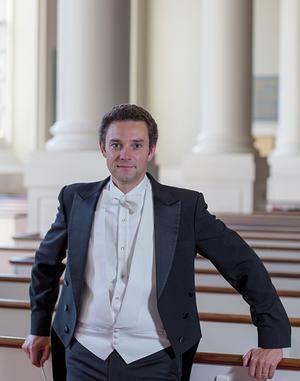 Recently appointed Music Director of Lowell House Opera, New England's longest-running opera company, Mr. Jones also serves as Music Director of the Harvard Radcliffe Chorus, and is a frequent collaborator with Yale’s Schola Cantorum. As a conductor, he has guested with such organizations as Boston Modern Orchestra Project, Grand Harmonie, Pro Arte Chamber Orchestra of Boston, Boston Camerata, Emmanuel Music (Boston), Longwood Symphony Orchestra and the Handel and Haydn Society Orchestra, and led opera productions with Iceland’s Reykjavic Summer Opera Festival, Opera Boston, Lowell House Opera, Harvard Early Music Society, and Mannes Opera, among others. Engagements of note this season include Mr. Jones’s debut as Music Director of the Lowell House Opera, performances with Harvard University Choir and Grand Harmonie, and Harvard Baroque Chamber Orchestra. In December, he leads The 106th Annual Christmas Carol Services at Memorial Church, America’s oldest carol services. Recent guest conducting includes the Boston Modern Orchestra Project, Handel and Haydn Society, and Emmanuel Music. Previous posts include serving as Music Director for Intermezzo Opera (2011-2014), Assistant Conductor and Chorus Master of Opera Boston (2006- 2011), Music Director, Reykjavic Summer Opera Festival (2002-03), Assistant Organist of Christ Church United Methodist on Park Avenue in New York City (2000-2003) and Chorus master and Assistant Conductor of the New York based Regina Opera Company (2001-03). Mr. Jones has also worked with William Christie, Sir John Eliot Gardiner, Christopher Hogwood, Nicholas McGegan and Gil Rose. An accomplished organist, Mr. Jones also plays the organ for Harvard University services and events. In addition to performances, during his time at Harvard Mr. Jones has overseen the publication of a new university hymnal, the installation of two new pipe organs in the Memorial Church, and has commissioned works from some of America’s most prominent contemporary composers, including John Rutter, Alice Parker, Daniel Pinkham Emma Lou Diemer and Tarik O'Regan. The Harvard University Choir’s latest CD is Spring Bursts Today: A Celebration of Eastertide. A native of Wales, Edward Jones studied music at Cambridge University, where he was Organ Scholar of Emmanuel College, and served as conductor of three university orchestras. He received his Masters of Music in orchestral conducting from Mannes College of Music in New York City, where he was the recipient of the Felix Salzer Memorial Award. Mr. Jones resides on the East Coast with his family.